18 watt 1x12 combo amp with tremolo, hand wired right here in North Carolina! Payments as low as $63/mo. Or, apply & pay as little as $63/mo. Gorgeous clean tone with a beautiful tremolo in a nice small package !!! 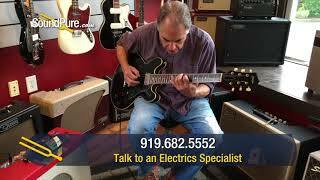 In this video, Sound Pure electrics specialist Eddie Berman plays the Collings I-35 LC Jet Black Aged Semi Hollow #181065 through an Elliott Veralux 1x12 Combo Amp with a Xact Tone Solutions Imperial Overdrive Guitar Pedal and a Strymon El Capistan dTape Delay Effect Pedal. 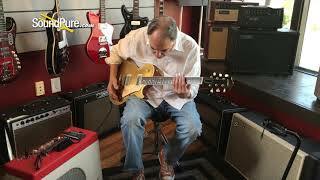 In this video, Sound Pure electric guitar specialist Eddie Berman plays a Collings CL Gold Top Electric Guitar #181134 through an Elliott Veralux 1x12 Combo Amp using a Strymon Brigadier dBucket Delay Effect Pedal and Strymon Riverside Multistage Drive Pedal. The Elliott Amplification Veralux Amp is based on the famous 5F11 circuit. At low volume, you can enjoy warm, clean tones that allow the natural voice of your guitar to shine through. At higher volumes, our updated Power Stage allows your tone to fold into a rich, well-defined experience. This dynamic voice quality is enhanced by our unique foot-switchable Biased Tremolo. The Biased Tremolo is controlled by dedicated speed and depth controls and delivers a smooth, expressive tremolo effect with no lossof the original input signal. Utilizing two 6V6 power tubes and two 12AX7 preamp tubes, this classic circuit maintains its rich, harmonic composition at any volume. Tonal clarity is delivered to the room by a Celestion Alnico Gold 50 Watt speaker. The Veralux features three single channel inputs:1-High, 2-Normal, and 3-Low, all controlled by a single volume control. A single tone control allows shaping of the overall voice of the amp. The tone control can also allow only the voice of the power stage tobe heard when dimed out. In addition to the hand selected speaker, capacitors, and resistors, our proprietary custom-wound Power and Output Transformers provide all of our amplifiers a true voicethat you will feel with every note. Our amplifiers are perfect for both small and large stage applications. They have enjoyed real-world touring experience with Peter Stroud (Sheryl Crow, Sarah McLachlan), Drew Shirley (Switchfoot), James Duke (Jesus Culture, Matt Redman), andmany others. We look forward to adding your name to the list. All Elliott Amplification products are proudly hand-wired in Hiddenite NC, USA. People come to our shop all the time and we often hand them one of our guitars to play. A couple hours later they're still playing and realize they're late for something. The reason it's our motto is that it happens a lot. There's a lot behind what we do and why we are creating the product you see. In every aspect, we strive to build guitars that truly inspire players. When you pick one of our guitars up for the first time, we want it to feel as comfortable as if you've played it your whole life. We want that vintage familiarity, but with much more consistency and attention to detail. Familiar but better. There are three key factors that drive us as we build: Playability, Tone, and Cosmetics. There are too many guitars out there that lack at least one of these qualities, and our passion is to offer you an anecdote. We love the guitars we build and we love the people who play them. When it comes down to it, we want you to be inspired to play. And play it loud and proud.